It seems there's a plethora of new toys imminent. If you read the countless blogs and sites that predict such things it becomes quickly apparent that both Canon and Nikon are about to announce new gear that is guaranteed to get the pulse of even the least ardent gearheads racing. But should they really get excited? What exactly is the fuss likely to be about? More megapixels? Maybe better low light ability? How about a better build? Or maybe even a faster frame rate? I'll leave video aside for the moment as I'm a stills photographer so haven't dabbled in this esoteric - to me at least - branch of the imaging world). Hang on a second. Are more megapixels necessary? Currently you can get above 20mp with a number of cameras including the affordable Sony A900 and A850. Then there's the Canon 5Dmk II as well as the more expensive 1Ds mk III and the Nikon D3x. Okay, so maybe you'll cry poverty and say that even Sony's offerings are too expensive. I'd argue that 20+ mp isn't actually necessary in any case. The 12mp D700 performs incredibly well even above A3+ print size (I've had a 5m wide mural printed from a 12mp file and last year shot my biggest assignment was shot on a D700 - the format of the book was A3 landscape and there were a number of full bleed images in it). Suddenly we realise that the current benchmark is around 14-16mp in enthusiast and even entry-level DSLRs. The Nikon D7000 is quite frankly incredible. The Canon 7D is one of the best cameras I've ever held and shot with. Then there is the aging but wonderfully versatile Nikon D300 and the more than serviceable Canon 50D. My favourite of course is Nikon's D700 which also ticks the low-light performance box (I've shot events happily at 3200 ISO and even punched up to 6400 without any serious issues). Ah, the thorny issue of build quality. Well, we already have it in spades. Nikon's enthusiast range is practically bomb-proof and Canon is no slouch either (although I'd question their entry level build to be honest). Build quality is not going to improve for any of the entry-levels in any case, and is pretty much state of the art in the professional grade cameras already. Similarly frame rate is only really going to affect the pro bodies. Now it's practically guaranteed that video performance is going to improve. As I mention above this doesn't affect me. I suspect that it doesn't really affect a great number of photographers out there. For a brief while the DSLR has reigned champion in the shallow depth of field camp for videographers. Now with the introduction of several APS-C format sensor video cameras I suspect that better video performance in a stills camera is going to be less exciting for videographers. As photographers we have never had it this good. There is really isn't a single digital SLR out there that cannot produce top quality imagery given the ability of the photographer. Quite frankly it isn't the gear that makes great images, it's the photographer. Buying a new camera isn't going to suddenly improve one's abilities. I freely admit that I will be amongst the ranks that have mop up my own drool when the new glut of cameras start being announced in the coming two months. Will I actually go out and buy them? Maybe if my current setup breaks, then yes. I have it good right now. This is just a guess, but I suspect a good one nonetheless. A vast number of buyers who dish out money for the new equipment will already have perfectly good gear on hand right now. what comes in the next short while is not going to revolutionize the average photographer's work (unless of course the manufacturers bring out a paradigm shifter of a camera...which is highly unlikely). So get to love what you have...a smile broadly when you can buy a D3x or 1DsmkIII for peanuts secondhand when some well-monied photog believes that the new whatchamacallit is going to improve their images. What with the rush to go all nostalgic in some quarters I thought I'd put out my Christmas gear wish and maybe St. Nikon will listen (yup that's likely!). Said rush obviously refers to some of the more retrospective styled cameras that can be found on dealers shelves. The camera that knocked the socks off the enthusiast buying public is of course the Fuji X100. This small range-finderesque camera harks back to an era of photographer centric machines that were a joy to use as much as to hold and look at (if you are that way inclined...sadly I am as a shelf of antiquated but beautiful cameras in my studio attests to). Leica of course have their highly sought after, but seldom owned (it's the same price as a small car) M9 and Pentax have recently tried to jump on the band-wagon with the newly announced Pentax Q interchangeable lens camera. Forum also abound as to the use of older M42 Leica lenses on a the new glut of Micro four thirds cameras in a bid to create an affordable 'Leica-like' manual camera. Interchangeable lenses (except of course for the X100 which almost immediately drew criticism that it was an interchangeable lens camera, to which rumors now abound that Fuji will indeed pursue such a camera). Simplified manual controls (Having played with a Leica M9 I have to admit it was sheer joy using the simple dials and buttons of pre-electric cameras. The true irony is that an experienced photographer can work faster with the older controls ala the Nikon F4 and and FM than the newer button frenzied layout of say the D5100). Small (Forget pocketable for the time being. Compare a D3 with an FM and you get my meaning. The modern well built camera can be used as a stop for a truck on a hill. It's big, it's heavy). Good image quality coupled to RAW image capture. So with this is mind comes my Christmas wish from Nikon (quite frankly any camera manufacturer but Nikon and Pentax are those best placed to perform such a request). Nikon (and Pentax) both have in their parts inventories the necessary bits as well as knowledge to create such a camera with relatively little R&D. There obviously are some complications inherent in what I am about to put forward, but they are nowhere near the league of complications that arise with massive frame rates and video abilities etc. etc. etc. 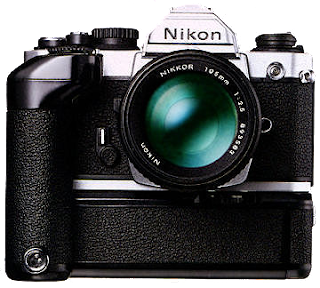 So, why not create a digital solution for the old manual metal cameras such as the Nikon FM? Nikon has produced the most incredible cult classic in the chassis of the FM. Not only that but the FM spawned a legacy of cameras - the FM, FE, FM2, FE2 and FM3a - that had interchangeable accessories, the back and MD12 motordrive which are the most important in this case. Why not create a digital back connected to an MD12 chassis that can be attached to any of the FM series cameras, or at the very least the FM2 and up (The FM lacked some of the electrical components of the the later models). The parts are there. I suspect that the buyers are there too. For a second just consider the D700 without the vertical grip. This is a fairly small camera in terms of full frame offerings. The surprising thing is that an FM2 with motordrive is only marginally larger and heavier. Place an EL-e3a battery in the MD-12 and the weight actually goes down. What the buyer of such a camera wants is not a million frames a second, or even 5 for that matter. They don't necessary want video capabilities or even live view (although admittedly that would be nice for critical focusing). Yes Nikon (or Pentax), you will be chastised by the internet reviewers for not including video, and all the other niceties of the modern uba-DSLR, but I don't know a single avid enthusiast who will not want that camera. Go beyond these requests (like doing all this in just a bolt on back with manual advance) and the Nikon fraternity will beat a path to your door. Well that's what I think at any rate. addendum: The reason I say Pentax is also capable of doing this is that both Nikon and Pentax are the only manufacturers of DSLRs that still have the same lens mount (I leave Leica R out of the equation here) as when they originally introduced bayonet lens mounts. This means that an autofocus lens will happily sit on an old brass bodied camera such as the FM or Pentax's classic K1000 or ME Super, so long as the lens still has an aperture ring.